Applications are invited from suitable Candidates to fulfill the 06 Jobs in Baluchistan Institute of Nephro-Urology Published in Daily Jang Newspaper 05th February 2018. 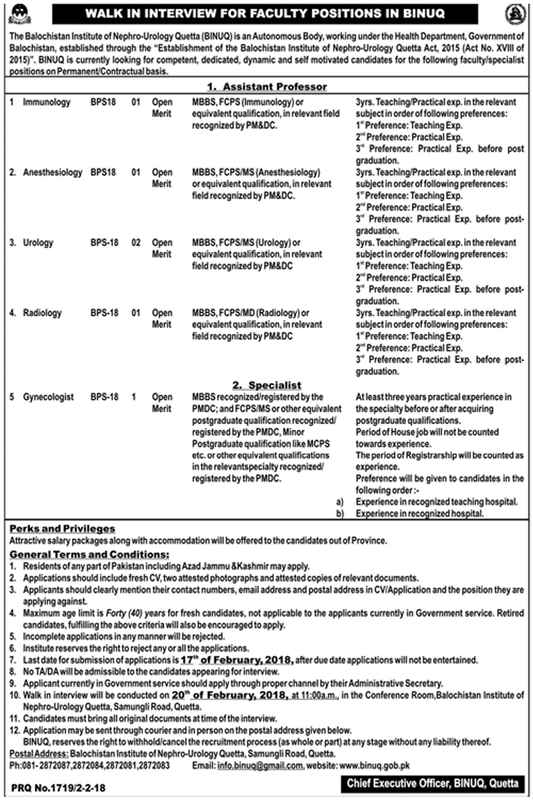 Candidates fulfilling the required criteria may apply for New Baluchistan Government Jobs 2018 against the titles of Immunology (BPS-18), Anesthesiology (BPS-18), Urology (BPS-18), Radiology (BPS-18), and Gynecologist (BPS-18). Attractive Salary Package and Accommodation will be offered to candidates out of Province.